Today's project was quick, easy, and inexpensive. "It's 2014. 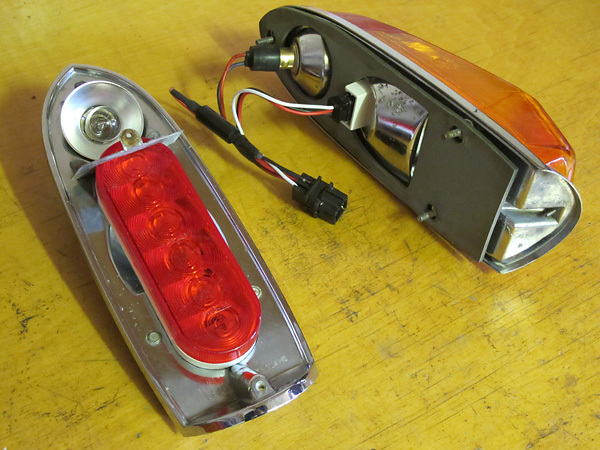 Almost every single tractor trailer now uses light emitting diodes for rearward lighting. signals. Bottom line: more effective and much more reliable lighting. Total cost: less than $30." While we are on this, let's remember that Brian sells what looks to be a very well done LED tail-light conversion (with significantly more LEDs in it). I do not recall his selling price though. But well done Curtis. Very slick use of an existing product. I used Optronics brand lamps, but you could use Truck-Lite, Grote, Peterson, or some other brand. The oval size/shape is an industry standard, but lens height and wiring/connectors vary. These lamps have a molded-in connector that lined up with the existing holes in my MG's body. I didn't make any mods whatsoever to the Optronics lamp or to the MG bodywork. The Optronics lamp housings are completely sealed, which I think is important because the Lucas housings tend to leak. Optronics is an American company, but these particular lamps were made in Taiwan. Advance Auto sells them, but they're cheaper online. I bought mine kitted with wiring and mounting grommets (which I didn't use) - here - for $27.19/pair. I used diodes that I already had laying around. They're Pektron part number A75-294. It turns out, they're an original MGB part that Moss sells for $32.25 each (part number 181-855.) As much as I love and admire Moss, that's obviously an outrageous price. I phoned my local Volvo Trucks dealership. They sell the exact same part for $8.27 each (as Volvo part number 1578857). And that's a dealership price. I bet if you shop around, you can probably find Pektron diodes for about $2 each. The Pektron parts are convenient to use because they have spade terminals already, but they're just diodes! Edited 3 time(s). Last edit at 05/13/2014 12:33PM by Moderator. When you brake and are signaling, you lose the signal light. Is that legal? Diode "B" ensures that your front signal light will still blink so that people ahead of you will see you're turning. As for legality: as long as I signal before my turn, I'm legal. I could use my arm or a semaphore flag or whatever. I should of course be signaling turns well before before applying brakes. If I thought this wiring were a problem, the easiest way to rectify it would be to simply disconnect the wire between my incandescent brake lamp (above) and my LED brake/turn lamp (below). I could do so in two seconds without tools by simply unplugging diode "A". My LED turn signal would still be brighter than the 1156 bulb it replaced AND I'd still be using it as a second marker lamp too. Alternatively, I could add relays to my wiring to make the rear turn signals override the brake lights. No need for relays Curtis, have a look at this. Will make all the lights work as Mr Lucas intended. The only caveat is that an incandescent bulb is needed somewhere in the turn signal circuit in order to supply a ground. I'm assuming the front signal is still this way so that will work just fine. Otherwise a loading resistor will be needed. On a turn, the led module is grounding through the stop light bulb. And the turn signal flashes the led. On a stop, the led module grounds through the turn signal bulb. And the stop light powers the led. On stopping with a turn, the stop light powers the led and the signal light alternates power and ground causing the led to flash. Flashing on a stop will be reversed in relation to the front lights. but who really cares. Hope that makes some sense as I may have consumed a Scotchy Scotch or two. I've looked at this schematic of yours a bunch of times and each time I end up being confused by another aspect. Are the grounds for the leds running back to the positive/power source? I'm no electrical whiz but maybe this is some voodoo with leds? Current flows through diodes in the direction of the arrow. Remember that the lamp ground is the car chassis. I finally got around to wiring in the additional diodes. I'm happy to report that the improved schematic works very nicely. I've printed this out and have diodes, lamps and connectors in hand. I'll follow the schematic and report back. Thanks guys, I'm considering changing to early tail light assemblies and making the upgrade myself.